Experience a truly sophisticated and contemporary Key West, Florida, resort when you choose The Santa Maria Suites. Barely a block from the Atlantic Ocean and Duval Street, the elegantly refined all-suites hotel is nothing short of breathtaking. The charm of Key West along with spacious suites and gracious amenities await you at our hotel in Key West, Florida. 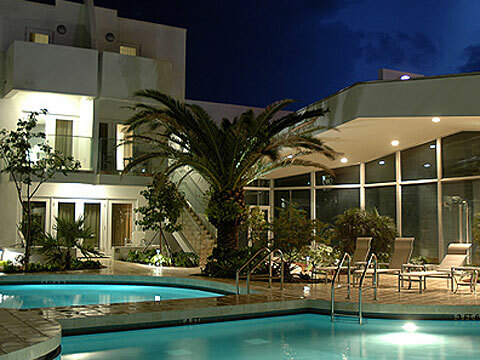 The Santa Maria Suites Resort resides on the site of a long time Key West treasure. Everything is completely original in homage to our historic designation, the original faÃ§ade and the restaurant remain intact. Key West vacation rental homes are not the best choice for everyoneâ€”sometimes a bit more panache is in order. The contemporary furnishings and appointments of our retro-inspired guest reception area combine historical significance with a fashion-forward Ã©lan. We challenge you to find another hotel in Key West, Florida, with more style and elegance. Amenities Guest suites with private balconies and terraces enclose a secret garden sanctuary. The clever attention-to-detail extends to each of our stunning two-bedroom guest suites. The kitchen amenities alone are enough to inspire your culinary flair. DoveÂ® candies on your pillow at turndown service, Bath & Body WorksÂ® bath products and full concierge services are other elegant perks youâ€™ll remember long after youâ€™ve returned home. Our location is perfect for exploring Key West - just one block from Duval Street and a short walk to the Atlantic Ocean. A car isn't necessary - it's all within walking distance. If you do drive to Key West, we do offer complimentary off-street parking. For vacation rentals in Key West, you shouldnâ€™t settle for anything less than the Santa Maria Suites Resort. Accommodations Enjoy Our Luxurious Accommodations in Key West, Florida Each of the 35 luxury Key West guest suites feature ultra-stylish contemporary furniture and include amenities that will make your stay practically stress-free. Well-equipped kitchens and baths that posses a distinctive spa ambiance make our suites in Key West some of the most memorable on the island. Guests of the Santa Maria will be pampered in luxury and sophistication with all the conveniences of home. Whether guests wish to entertain themselves or their friends, an island kitchen provides the center to gather around. With custom gloss white cabinets, surrounded by back painted glass Ankara stone and sea foam granite, the island kitchen, with its full compliment of appliances and amenities is a place for canapes, parties and conversation. Offering quite a bit more than most Key West rental homes, our unique hotel is also ideal for those traveling in groups. We invite you to peruse our photo gallery and see for yourself what makes the Santa Maria Suites a sophisticated escape from the ordinary. Luxury 2-Bedroom Villa These two bedroom, two bathroom luxury villa boast fully equipped state-of-the-art kitchens, in-room washer and dryer and two seating groups in the living room featuring a flat-screen video and entertainment center. The two bedrooms, located on the second level, have one queen bed in each bedroom, large closets, in room safe and custom-designed leather furniture. This Villa has a half bath located on the first floor and one bathroom in each guestroom. The bath and shower are designed with natural stone counters and marble walls with large mirrors providing a spa-like feel. As the villas are located on the second level of the resort you will enjoy a private balcony overlooking the sparkling pool below. The villas are located on the second level of the resort with the balcony overlooking the inviting pool. Luxury 2-Bedroom Suite Our popular two bedroom, two bathroom luxury suites feature well-equipped kitchens and an in-room washer and dryer. Each suite has two seating groups in the living room featuring a flat-screen video and entertainment center. Bedrooms have one king bed in each bedroom, large closets, in-room safe and custom-designed leather furniture. Bathrooms feature raised basin sinks and marble walls with spa-type large mirrors. Welcome the morning with coffee on your private patios or balcony. Luxury 2-Bedroom Pool View Villa Choose this two bedroom, two bathroom luxury pool view villas with chef-ready kitchens and two seating groups in the living room featuring a flat-screen video and entertainment center. Both bedrooms, which are located on the second level, have one queen bed in each bedroom, large closets, in room safe, and custom-designed leather furniture. There is a half bath located on first floor and one bathroom in each guestroom, featuring one bath and one shower with natural stone counters and Chinese glass tiles adding to the soothing atmosphere. Luxury 2-Bedroom Pool View Suite Two bedroom, two bathroom luxury suites with pool view and fully equipped state-of-the-art kitchens and an in-room washer and dryer. Each suite has two seating groups in the living room featuring a flat screen video and entertainment center. Bedrooms have one king bed in each bedroom, large closets, in-room safe and custom-designed leather furniture. The bathrooms feature natural stone counters and marble walls with large mirrors providing a spa like feel. As the villas are located on the second level of the resort you will enjoy a private balcony overlooking the sparkling pool below.Amenities Amenities of the Santa Maria Suites: Sophisticated and Refined One visit will tell you that the Santa Maria Suites offers much more than the average Key West villa rentals. In fact, we believe that our thoughtful amenities are one of the things that separate us from other hotels in Key West, Florida. Enjoy a DoveÂ® ice cream treat as you check in and in the evening your bed will be turned down, fresh towels put in place, a Dove chocolate on your pillow to delight in. Our stylishly elegant suites were designed for entertaining with maximum panache and absolutely no detail has been overlooked. Especially impressive are the state-of-the-art kitchens. Culinary equipment includes Jenn-AirÂ® cooktop and stove, Sub-ZeroÂ® refrigerator, CuisinartÂ® cookware, wine chiller, and much more. Youâ€™ll be free to let your creative genius run wild in a kitchen thatâ€™s as beautiful as it is functional. Exciting in-suite amenities include: * Complimentary wireless Internet access * Three flat-screen TVs * Living room TVâ€™s are equipped with a DVD player and A/V input for easy connection for a laptop, video game console or a camcorder. * Custom-designed leather furniture * In-room safe * Daily housekeeping * Nightly turn down service with clean towels and fresh muffins for breakfast * Well-equipped state-of-the-art kitchen * Wine chiller * Microwave * Dishwasher * Coffemaker * In-room washer and dryer * Bath and Body WorksÂ® bath products In addition to our extravagant suite amenities, we also offer the following thoughtful services: * Pool towels * Bellman * Multilingual staff * Two Garden-enclosed heated swimming pool * Full-service concierge * Complimentary parking * Handicap accessible * No hidden resort fees We encourage you to take advantage of the services of our on-site concierge. They stand ready to assist you as you strike out to explore the excitement of Key West. They can help you arrange excursions, water sports activities, bike rentals and more. Have a taste for a certain cuisine or looking for that perfectly quirky gift shop? Our friendly and knowledgeable concierge can point you in the right direction!